Veteran of the Day graphic created by Emma Catlett for the U.S. Department of Veterans Affairs. 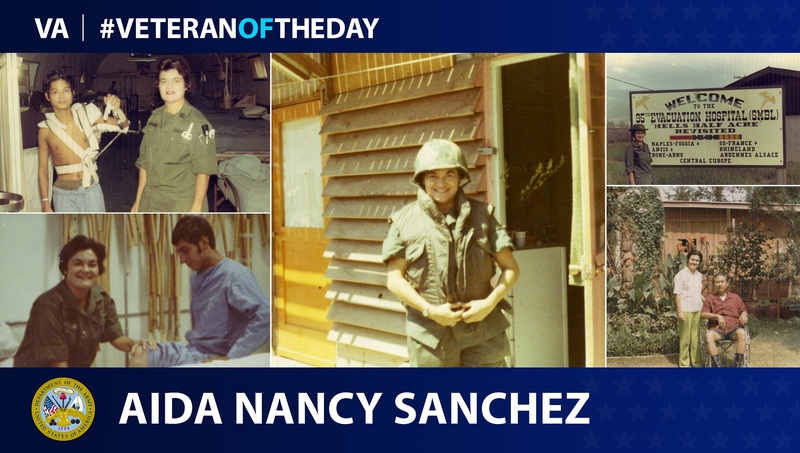 Today’s #VeteranOfTheDay is Army Veteran Lieutenant Colonel Aida Nancy Sanchez. Aida served during the Vietnam War from 1952 to 1976. Aida was born in Santurce, Puerto Rico in November 1931. She graduated at the age of 15 and won a scholarship to attend St. Mary of the Woods College in Indiana. She graduated in 1952 with a bachelor’s degree in biology and chemistry. Upon graduation, she applied and was accepted into the army physical therapy school program with an age waiver due to being under 21 at the time. Aida then headed to Fort Sam Houston, Texas to attend and graduate from the program in 1953. This is where she also met then General Dwight Eisenhower. Afterwards, she was assigned to the Brooke Army Medical Center at Fort Sam Houston then to Fitzsimmons Army General Hospital in Denver, Colorado around 1956. During this assignment, Aida met President Eisenhower when he came to visit his friend whom was her patient. She stated that he remembered her from the physical therapy school and sent a pot of stew he made a day or two after the visit. After she completed her assignment at Fitzsimmons, she was sent to Rodriguez Army Hospital in Puerto Rico until she was discharged from active duty and went into the army reserves for two years. During that time, Aida worked for the Edward Hines Jr. VA Hospital in Hines, Illinois for a year before becoming the Director of the Bureau of Crippled Children within the Department of Health of Puerto Rico. During her time in Puerto Rico, she received a letter from the Department of Defense stating that they needed more physical therapists, so she decided to return to active duty. Her first assignment was the burn unit at Brooke Army Medical Center, then she was sent to Fort Bragg, North Carolina for a year or two. Afterwards, Aida was sent to Fort Myer, Virginia to establish a physical therapy clinic within the Andrew Rader Clinic at the Walter Reed Army Medical Center. Once setting up the unit, Aida was sent to graduate school at the University of North Carolina at Chapel Hill and upon graduation was assigned to Letterman Army Medical Center to oversee the clinical affiliations of five universities located near the hospital. Aida’s next assignment was to become the assistant chief of physical therapy at the Tripler Army Medical Center in Hawaii before she received orders to deploy in support of the Vietnam War in 1970. She was originally sent to the Army hospital in Saigon to replace the physical therapist but was routed to the 95th Evacuation Hospital near Da Nang to establish the first physical therapy clinic within the hospital. During her tour of duty, Aida was extended to deploy to Cambodia and assist then President Lon Nol because she had previously helped him during his stay at the Tripler Army Medical Center. She was constantly flying back and forth between Vietnam and Cambodia to help the president get physically better. She assisted many American and Cambodian soldiers and citizens with their physical therapy needs while deployed. After Aida redeployed, she was sent to Fort Gordon as the chief physical therapist who oversaw the transfer of the physical therapy clinic from older barracks into the newly built Eisenhower Army Medical Center. It took about six years to complete the task and Aida retired as a Lieutenant Colonel shortly after with about 24 years of service. Thank you for your service, Aida! More of her story can be found at http://memory.loc.gov/diglib/vhp/bib/loc.natlib.afc2001001.43733.